Peggy Whitson, Commander of NASA’s Expedition 50/51, a 4-H alumna, answered 4‑H’ers’ questions via down-link from the International Space Station (ISS) to Johnson Space Center in Texas. While on the ISS, she will surpass the current record of 534 days in space. As a way to promote awareness of 4-H history, Tompkins County mobilized the theme “4‑H Memories Last a Lifetime” by collecting memorabilia (1932-2015) for a Memory Wall at the 4-H Fair. Members, leaders and parents contributed items and county staff cleaned out old files to populate the exhibit. 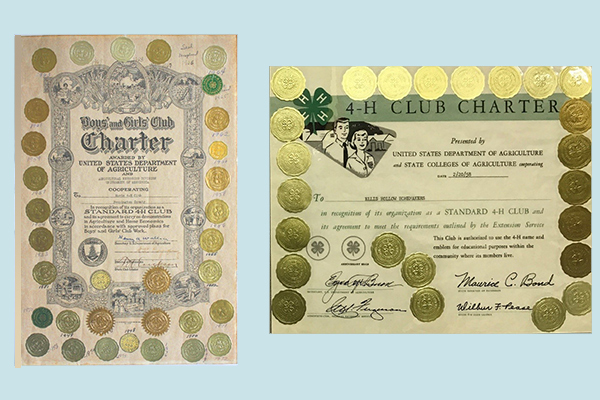 These are examples of National 4-H Charters that were cherished by many 4-H members and families for the things that were learned and projects completed by countless youth through loving guidance of dedicated adult volunteer leaders. Both charters were signed by the then-current Secretary of Agriculture and represent charters issued by USDA to clubs across the country at that time. The Mavis 4-H Club (left) of Pennington County, Minnesota, received their charter in what appears to be 1944 and met charter requirements through 1978 (34 years), while the Ellis Hollow Homemakers (right) of Tompkins County, New York, received their charter in 1958 and continued to complete the year’s work through 1981 (23 years). Who was Jessie Fields Shambaugh? A film by an Iowa 4-H’er entered in the 2016 “FilmFest 4‑H” answers that question for you. Adam Clayton’s film took second place in the “Voices of 4‑H” category. This year’s “FilmFest 4-H” is July 23-27 in Kansas City. Steve Cauthen, a 4-H’er from Kentucky, started racing in 1976; in this first race, he came in last; in his second race he came in first. In 1977 he led the nation in horserace wins with 487. The Triple Crown was not won again until 2015. In the 10 years the 4-H History Preservation Team has been working, we’ve collected 88 different 4-H calendars, printed calendar images and pieces of original artwork. Here’s one recently uncovered on which we have no information; we’re hoping your vivid 4-H memories can help us date it. 4-H History Preservation Team Celebrates 10th Anniversary! The National 4-H History Preservation Program started in 2007 with a group of seven volunteers, mostly retired national level 4-H staff; we now number 12, including some current staff and some retired state staff, all still volunteers. The number of visitors to our website is rapidly nearing 200,000 globally and our Newsletter reaches some 5,900. We’re grateful for that generous response. We rely on your continued support; please email us. This entry was posted in 4-H History Preservation Newsletter, History and tagged Adam Clayton, FilmFest 4-H, NASA, Peggy Whitson, Steve Cauthen by NewsAdmin. Bookmark the permalink.